Gustavus Adolphus Senior Skylar Davis (Palatine, IL) has been profiled by Rich Mies as a part of the College Sporting News/MIAC Profiles of Excellence series. 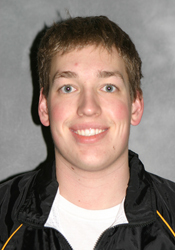 Davis, the 13-time All-Conference performer, most recently had the top Gustavus finish at the NCAA Championships by taking third in the 1650 freestyle with a time of 15:39.12. It was the first time that Davis made the podium at the NCAA Championships, as he became a four-time All-American in the 1650 freestyle.